Sing a Song of Sixpence; Pat-a-Cake, Pat-a-Cake; Peter, Peter Pumpkin Eater; Hey Diddle Diddle. How many nursery rhymes do you remember? Do you recite them to your young children? Do you realise that one of the key predictors of early success in reading can be how well children know their nursery rhymes? Yes. All of those nonsensical verses really matter. They matter because they rhyme, a very important part of the reading process. Phonological awareness (and its subset phonemic awareness) are aural and oral skills that allow children to understand that speech is made up of words, and that words are made up of distinct sounds and sound patterns, essential in learning to read. Rhyme and rhythm which abound in nursery rhymes help children develop an ear for our language, a precursor to learning to read. This makes a great deal of sense but unfortunately, research suggests traditional children’s rhymes are becoming so unpopular with parents they could die out. A survey by the charity BookTrust in the United Kingdom found almost two-thirds of parents do not regularly read nursery rhymes to their children because they did not believe they had any educational value, while others believe them to be too old-fashioned. Yes, nursery rhymes have been with us for centuries but is this necessarily a bad thing? They provide loads of oral language development and connect children to the past. They gain a glimpse of life before electricity when reciting ‘Jack be nimble, Jack be quick’, or life before plumbing in ‘Jack and Jill’. You will notice there is no indication in the rhyme that Humpty should be an egg. Originally, Humpty was thought to be a cannon, under attack in the Siege of Colchester in 1648. The attacking side destroyed the cannon and none of the king’s horses or the king’s men could put Humpty back together again. When Humpty Dumpty became an egg: the original book engraving. Emily Blatchford, writing for The Huffington Post, enlightened us with her comment that we can thank Lewis Carroll, of Alice in Wonderland fame, and his 1872 novel Through the Looking Glass. 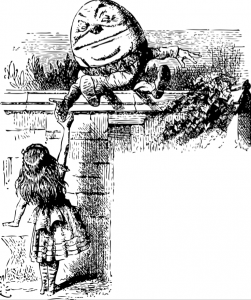 Chapter Six is entitled ‘Humpty Dumpty’ and it’s here that Humpty Dumpty first appeared as an egg, in John Tenniel’s delightful illustration. ‘Much like an omelette in a stainless-steel pan, this portrayal of Humpty Dumpty has stuck… and he’s been an egg ever since,’ she writes. Let’s return to why nursery rhymes are still essential today. 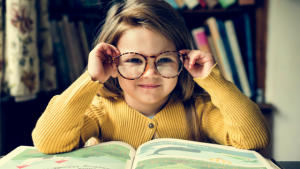 Listening comprehension precedes reading comprehension and for children to understand what they are reading they have to be able to hear the language first. Mem Fox reminds us that ‘once children have masses of rhythmic gems in their heads, they will have a huge store of information to bring to the task of learning to read, a nice fat bank of language; words, phrases, and grammar. The words in their heads then begin to drift into their daily speech and all at once we have an articulate child’. It is the repetitious nature of the rhymes that allows children to memorise basic structures and patterns in the English language, then put it all together. As they come to anticipate the rhyming word, they will make predictions, an essential skill in learning to read. Furthermore, they are not only learning new vocabulary but how to articulate words, modulate their voices and enunciate clearly. They are also simultaneously practicing pitch, volume, and voice inflection while experiencing the rhythm of language. When children go on to memorise nursery rhymes they are essentially undertaking a mini boot camp for their ever-growing brains. Nursery rhymes help children create mental pictures, expanding their imaginations and inviting them to be playful with words. Funny nursery rhymes allow children to develop a sense of humour. They are the perfect first stories for young children as nursery rhymes normally tell a story with a beginning, middle and an end. This teaches children that events happen in a sequence, making it easier to understand a storyline as they follow along. Nursery rhyme characters experience many different emotions. Think of the very frightened Miss Muffet or Doctor Foster who nearly drowned in Gloucester. Nursery rhymes can help children identify their own emotions or the emotions of others. The best learning usually happens in nurturing relationships. I can think of few things more nurturing than a child and parent snuggled up together sharing the joy nursery rhymes generate. If this is part of your routine, give yourself a huge pat on the back. If it isn’t all that common for you, perhaps tomorrow you’ll be off to the library and borrow a book full of them. Ultimately, you and your children can then have them wherever you go, like the fine lady on her way to Banbury Cross, adorned with rings on her fingers and bells on her toes, ‘she shall have music wherever she goes’. Diane Bourke is a Project Manager for Independent Schools Victoria. She was Head of Junior School, Campbell House, at The Geelong College for 16 years, and most recently, Head of Junior School, Morris Hall, Melbourne Girls Grammar for 15 years.